One of Lake Forest, Illinois’ most prestigious homes is still looking for a buyer after sitting on the market for several years with many price reductions. The massive 25,000 square foot manor, known as Mayflower Place, was previously listed as much as $18,000,000 in 2007 and closer to $10,000,000 in more recent years. It’s just been reduced to $8,950,000. It was designed by architect Frederick Wainwright Perkins in 1917 for former Marshall Field Chairman John G. Shedd as a wedding gift for his daughter Laura Shedd. According to Forbes, Laura and husband Charles Schweppe hosted King Edward, the Duke of Windsor, and many American industrial tycoons such as the McCormicks and Armours. Laura died of a heart attack in 1937 leaving the estate behind to husband Charles, who commit suicide in 1941. The property remained empty for more than four decades before selling in the 1980s. Between 1987 and 1988 the home was restored by 70 craftsmen and European artists & stone crafters. Today, the architecturally significant residence offers over 25,000 square feet with 28 rooms, 12 bedrooms, 11 full & 4 half bathrooms, marble fireplaces, intricate limestone mouldings and plaster relief ceilings. 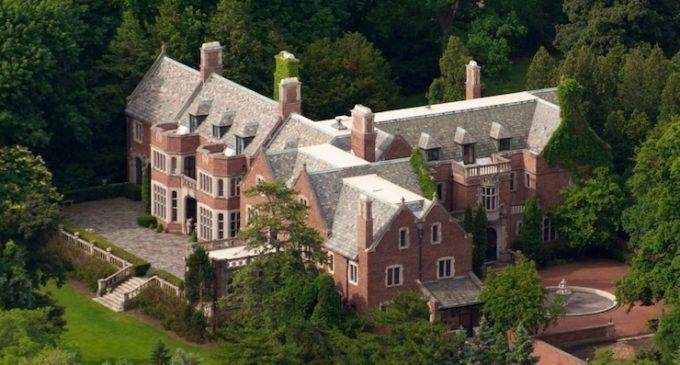 Enjoy over 5 acres of manicured grounds with extensive gardens, as well as 440 feet of lake frontage on Lake Michigan. All this about 43 minutes from downtown Chicago! It’s on the market for $8,950,000 $9,450,000 with Berkshire Hathaway.